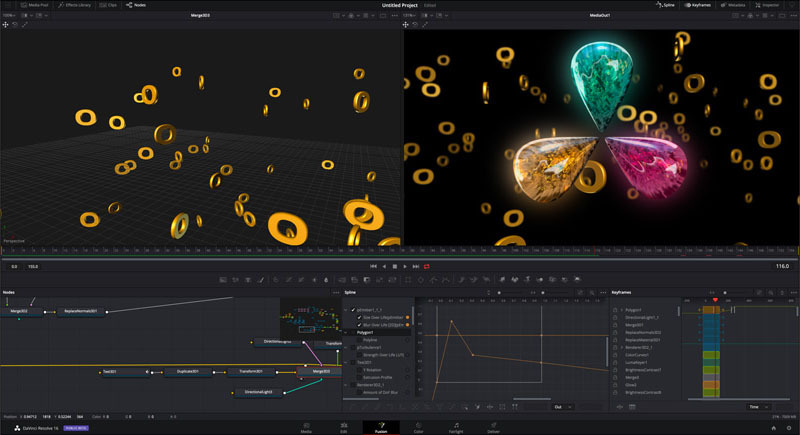 As teased earlier last week, Blackmagic Design has just officially introduced DaVinci Resolve 16 – a major update that adds a revolutionary new cut page specifically designed for editors that need to work quickly and on tight deadlines. In addition, the professional post-production suite now includes dozens of other new features for professional editors, colorists, VFX artists, and sound engineers. 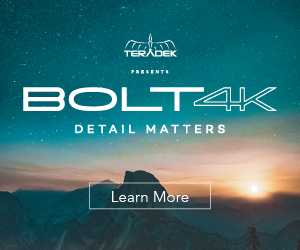 Designed specifically for editors working on high end fast turn around work such as television commercials and even news cutting, the cut page is all about speed. It’s an alternate edit page with a streamlined interface and revolutionary new tools that will help customers work faster than ever. The cut page lets users import, edit, trim, add transitions, titles, automatically match color, mix audio and more. Whether you’re delivering for broadcast or for YouTube, the cut page has everything you need to get the job done, all in one place. Plus, the regular edit page is still available, so you can switch between edit and cut pages to change editing style on the fly. Furthermore, video editors can now simply click on the source tape button and all of the clips in their bin will appear in the viewer as a single long “tape”. This makes it easy to scrub through all of the shots, find the parts you want, and quickly edit them to the timeline. It’s an old fashioned concept that’s completely modernized to help you find the shots you need quickly and efficiently. The new cut page also features an innovative dual timeline so you never have to zoom in or out again. The upper timeline shows the entire edit while the lower timeline displays the current work area. Both timelines are fully functional, allowing you to move and trim clips in whichever timeline is most convenient. Want to move a clip all the way to the end of a program? Simply pick it up from the lower timeline and drag it to the end of the upper timeline to move it down the edit. The latest version of Resolve now boasts DaVinci Neural Engine that uses “state of the art deep neural networks and learning”, along with artificial intelligence to power new features such as speed warp motion estimation for retiming, super scale for up-scaling footage, auto color and color matching, facial recognition and more. DaVinci Neural Engine is entirely cross-platform and uses the latest GPU innovations for AI and deep learning to provide unparalleled performance and quality. It provides simple tools to solve complex, repetitive and time-consuming problems. For example, it enables facial recognition to automatically sort and organize clips into bins based on people in the shot. 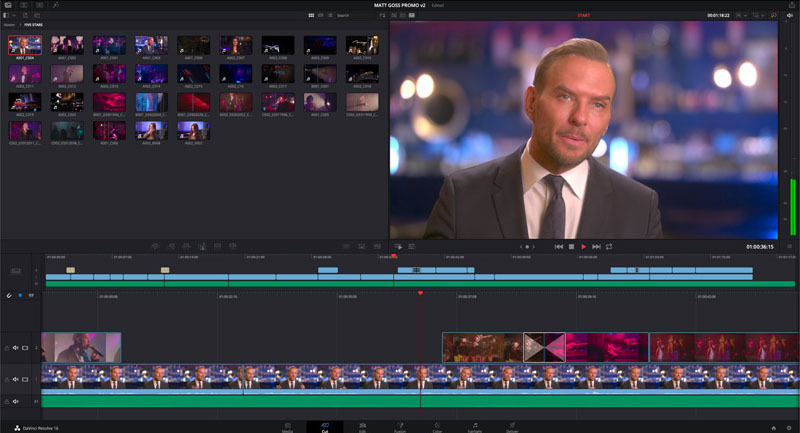 DaVinci Resolve 16 also introduces powerful new features such as new adjustment clips that let content creators apply effects and grades to clips on the timeline below. Quick export can be used to upload projects to YouTube and Vimeo from anywhere in the application, and new GPU accelerated scopes provide more technical monitoring options than before. The massively updated Fairlight page adds elastic wave alignment so you can stretch waveforms to precisely sync dialog replacement with video, immersive 3D audio support, new bus tracks, automation previews, dialog sweetening tools, and even more FairlightFX. 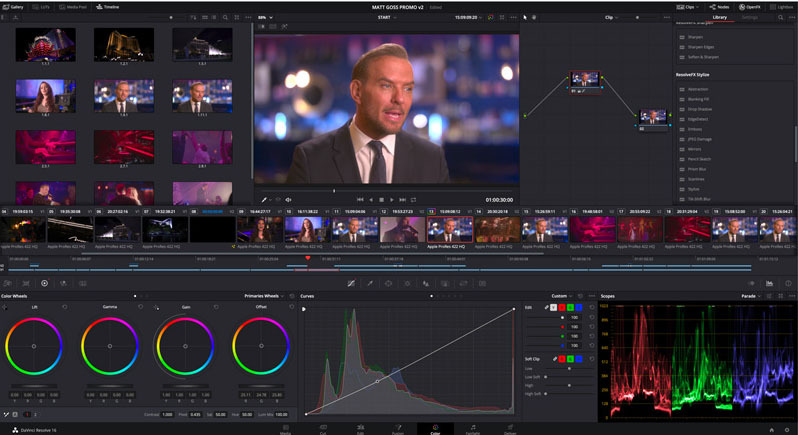 DaVinci Resolve Studio 16 features major improvements to existing ResolveFX, along with several new plugins that editors and colorists will like. There are new ResolveFX plugins for adding vignettes, drop shadows, removing objects, adding analog noise and damage, chromatic aberration, stylizing video and more. There are also improvements to the scanline, beauty, face refinement, blanking fill, warper, dead pixel fixer, and colorspace transformation plugins. Plus, you can now view and edit ResolveFX keyframes from the timeline curve editor on the edit page or from the keyframe panel on the color page. You can now download DaVinci Resolve 16 public beta from the Blackmagic Design website. 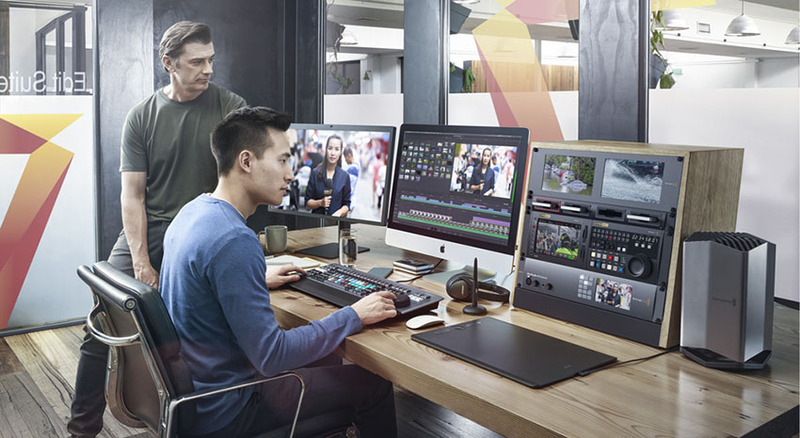 Blackmagic Design has also unveiled a brand new premium keyboard for DaVinci Resolve that dramatically improves the speed of editing as it allows the use of two hands while editing so transport control and selecting clips can be done while performing edits. 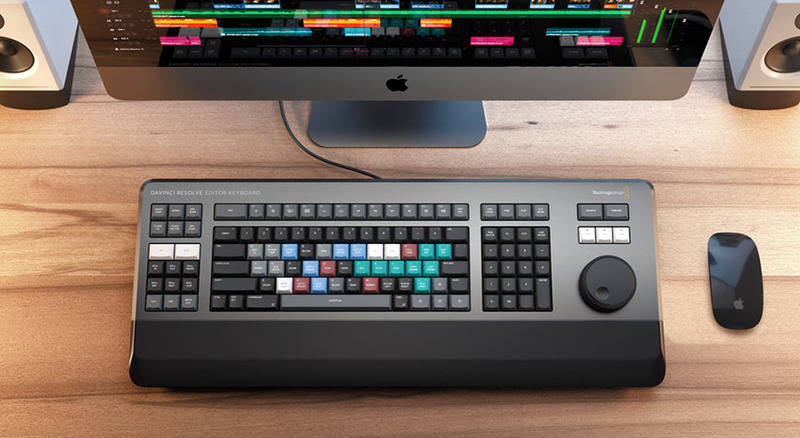 DaVinci Resolve Editor Keyboard will be available in August from Blackmagic Design resellers worldwide selling for $995.